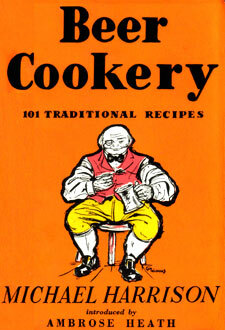 Publisher: Neville Spearman Ltd., London, 1953. Hard Cover, 143 pages, 5.00 x 7.50. When British writer Michael Harrison wrote this book in 1953, there were virtually no published sources available for cooking with beer. Inspired by a television segment on the BBC (hosted by Ambrose Heath, a renowned chef of the day, and the writer of this book's introduction), Harrison gathered together 101 historic recipes that use beer and released them in this wonderful book. In his introduction, the author writes, "The use of beer in cooking is a culinary practice of most respectable antiquity among the inhabitants of Britain; and it was only when French chefs began to establish their strong and enduring dictatorship that wine replaced beer in our national cooking." Among his historic recipes are Bier Au Gratin, German Beer Soup, Bortsch With Beer, Sole Gambrinus, Shrimps in Beer, Carpe a la Bier, Beer Bangers, Tipsy Pudding, Hot Beer Pudding, Gloucester Cheese-and-Ale, Swiss Baked Eggs and Beer, Beer Dumplings, Nuremberg Eggs in Beer Batter, Ale Nog, and many, many others.